Home / Dentures & Partials / Partial Denture – Why Do I Need One – Only Missing a Few Teeth! 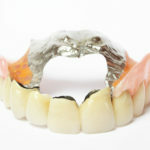 Why do you need a partial denture? We all know that often, it can be difficult to put our own needs first. There are always more needs and wants than we can afford: mortgage, car, education kids, vacations, toys…let’s face it, there are so many things we can acquire, and only so much cash flow. Yet as time goes on, our fixed expenses tend to decrease: the mortgage is paid off, the kids have gotten through school, and we find ourselves with disposable income again. Before we rush off to develop new expensive hobbies, it might be well to consider our own bodies and our own health, and make it a priority to invest our money there. In other words…if you have accepted tooth loss as a natural part of aging, illness or accident, and learned to live with it – learned to talk without lifting your upper lip, learned to smile with a closed mouth, learned not to laugh loudly for fear of showing your missing molars…maybe it’s time to consider an investment in your own appearance and self-confidence again. 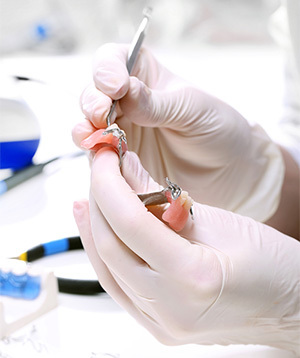 There’s more to getting a partial denture than just improving your appearance. Living with gaps in your teeth makes it more difficult to enjoy the health benefits of eating a varied diet. Not only might you have to live without enjoying some of your favourite foods, you might also be missing out on key nutrients, vitamins and minerals from those foods. In addition, the teeth serve an important function as placeholders in the jaw, preventing the bone from shrinking and deteriorating over time (which can give you a sunken, much older appearance). Partial dentures can help address this, ensuring that you place even pressure on all your teeth when chewing. Implant retained partial dentures are even better: the implants fuse to the bone just like the roots of your own natural teeth, preventing bone loss. At one time, a dentist would have simply extracted all your teeth on the theory that patients with a few missing teeth would be better off with full dentures. Fortunately, we’ve come a long way from such practices. If your remaining teeth are healthy or at least restorable, many options exist to fill in the gaps caused by missing teeth. For example, you could get a dental bridge, whereby replacement teeth that are colour-and-scale matched to your natural teeth, are cemented to strong abutting teeth to fill in those gaps. 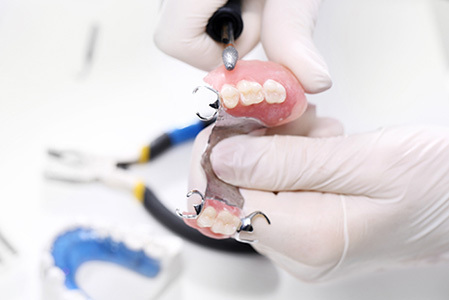 A partial denture which is secured to the surrounding teeth with clasps, is a removable option that you can choose to wear in certain situations, or all the time, according to your needs and desires. 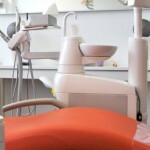 Individual and/or groups of teeth can also be replaced with dental implants. For people who have few remaining healthy teeth, partial implant-retained dentures like the All-on-Four denture, which is a full arch on either the upper or lower half of your mouth, could be a great option. This would involve extracting your existing unhealthy teeth and replacing them with strong, natural-looking teeth that are secured to the mouth via just four titanium posts implanted in the jaw. 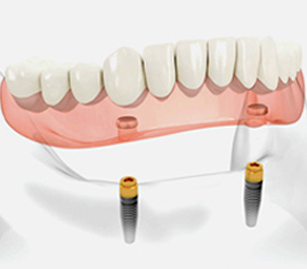 This technique provides you with the benefits of individual dental implants with the affordability of a denture. Even patients with significant bone loss can be good candidates for this procedure. If you would like to discuss all your treatment options in a comfortable, relaxed setting, maybe it’s time to book a free, confidential consultation with Dentures Direct today!